What I Wore Sunday | House Unseen. Life Unscripted. Dude. I tried to have other people take some head-to-toe photos (fail). Then I tried to use the timer to take photos (mega fail). And then I tried to find a full-length mirror so I could take a lame self-portraity portrait (super mega ultra fail...mostly because we have no full-length mirrors). In every shot I look like the 'before' picture for an epic Jenny Craig campaign and/or Invisalign ad. But I spent all that time doing this fool business, so I'm posting something, dagnabit. Oh yeah. Workin' the "drape straight down from the boobage (can I say that without offending you guys?) so as to mask any appearance of a waist whatsoever". I like to call this look "disheveled after wrangling toddler at Mass". And still, for the 9th day in a row, rockin' those snazzy boots from Kohl's (not a paid endorsement. I WISH!) which I love with every fiber of the apparel section of my heart (you can buy them here. And because I'm awesome, you can get 10% off using promo code TENBLOG. Still no, not getting paid for this) and a circle skirt scored at Goodwill. Perpetual love for the Gee Dub. Oh, and since this whole taking-photos-of-myself thing didn't quite work out, I whipped up a Polyvore style board because of course you're just dying (DYING!) to see what I carried on my shoulder and around my wrist and in my earlobes. You win in my department. I remember reading your posts from your old blog and then buying one of your cool necklaces. :) Fashion on! Did you really????? Oh my gosh. That's awesome! Wait.....WHAT???? What is this "old blog" of which you speak? Please don't make me google it myself. Running a google search of you for pictures for the Michael Bolton mashup already resulted in finding that you did modeling work. WHAT OTHER SECRETS DO YOU HOLD? Oh my goodness...you were a model??? I demand proof. Oh my gosh. Y'all be trippin'! I once wore a vest and my back appeared in an ad for a teeny tiny horse store. And I didn't even get paid for it! Well...my regular hourly wage as an employee of said store, of course. But seriously. I have never been an actual model as you can easily surmise by the awkwardness of my photos! Hahahahahaha! That is too funny. Totally get it. I don't think i've ever commented before, but I just can't resist saying... Yes! Taking outfit pics just feels so weird! Do I smile? Do I not smile? Do I turn my head at a funny angle so I'm mysterious? I always seem to end with a bit of a smirky smirk because I'm laughing on the inside about the fact that I'm about to post outfit pics on the internet!!! You sort of have that fashion-magazine-come-hither-stare thing going on. Pretty awesome! Love those boots!!! And you used to model? Do tell.....! I have been dying to find a burgundy cardi. Must get me one. Loves it! I tried to take ONE photo of me in a cute outfit for the blog and because our desktop with a camera is in the bedroom, I wound up standing on an unmade bed in my awesome outfit and having to contort myself, all sultry like, to even fit in the picture. Needless to say, that one won't be posted anytime soon. If I can rig up a better system, I'm totally joining the link-up. You're haircut looks great too BTW, but I'm wondering where the duck faced photo is? I bet I could totally rock the mantilla / duck face look next week if I tried. Great job with the photos! I had one photo my husband took while I was preparing to shove (cough...place) my son his car seat. 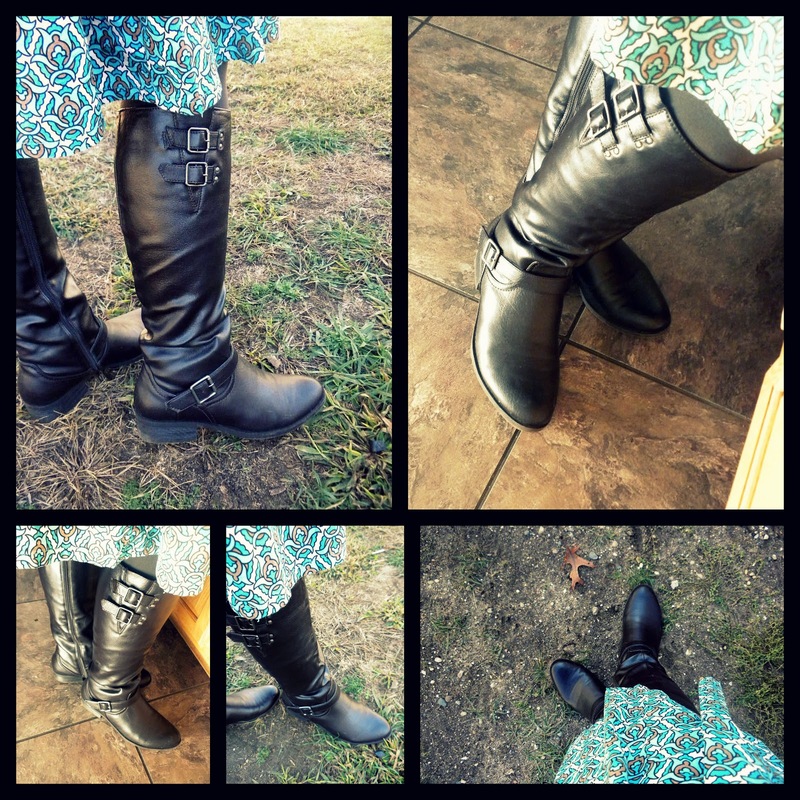 1) Love the boots! I've been looking for some boots lately and I may just be purchasing those ones you linked to!...Double twinners! The pose in the first picture reminded me of the famous still shot of Sasquatch as he moved away from the camera. You don't look like Sasquatch, of course, just the pose looks like it. You are lovely, you understand. Just the pose kind of looked like...oh, never mind. Seriously, you make me laugh so hard. Even while I'm at work. And the guys next to me are like "what the hell are you laughing at"
and then I have to pretend that I'm working and just laughing at myself to make me look like I'm working. Uhh. Fail. But anyways, thanks for linking up with us! And I love the boots. A lot. And the skirt. Great post. The polyvore board was an excellent idea. I'm just glad I'm not the only person wearing 6-year-old sweaters and thrift store skirts to Mass. Shhhhhhh! It's my secret weapon! Your outfit is super cute. The photos...erm...well. I haven't a clue how other people look "natural" and cute in their self-portraits. I'm more of a: Van Gogh - someone bit my ear off - you need to be hallucinating to appreciate this photo - type self-portrait. But I am not tripping balls and I appreciate the artsy-fartsy first photo!! So - WELL DONE!! This is one of my favorite posts, because it's so real! I look like a down-home farm-wife all week - no matching, no make-up look. But, Sundays are special b/c we all dress up, and the boys literally stare at me like I'm a foreign human being - clean, matching, curled and lip-sticked. The Polyvore outfit is A++++!! Love it!! ah. thanks for linking to not coolkidme. you better keep these up because you know I LOVE EM. and I went to Kohls today and lusted after those very boots. soul sisters you and me.